I've been down in the dumps lately. Way down. And although, I'm still not feeling all that, this has made me feel a little better, if only for a split second. Why, with all the butter, cheese, white bread, and milk, how could it not? 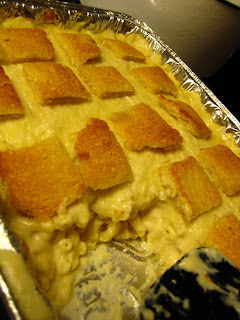 This is Martha's mac-n-cheese stolen from this wonderful website. This is the second time I've made it, only the first time it was better because my croutons were smaller, which, in 6 months (because that's how long it'll take to work off the calories), I will make that way. I guess my trip home to Hawaii has made me even more homesick to go back. This, in turn, has strengthened my desire to win the lottery, so I can breathe in the salty air from the porch of my imaginary beach front cottage. Working at my job with all its crazy management issues has not helped any. I need another vacay, a forever long trip to the spa, where I can receive lomi lomi massages everyday and pay someone to remove my blackheads (again, another reason to win the lottery). Instead, I'm off to wal-mart to buy hangers and bleach. Maybe, I need another smidgen of that mac-n-cheese.